Openreach has ditched the BT name from its logo in a no-frills rebrand to reflect the broadband wholesaler's enforced separation from its parent company. The company admitted there was little change with the new logo, which has kept the same purple name and typeface for Openreach, while dispensing with BT and a colourful swirl at the bottom. Openreach said: "It’s a pragmatic change rather than an extravagant re-design, because we’re determined to focus our investments on improving the network and the service we provide." Clive Selley, the chief executive of Openreach, said it was a "small but symbolic step". Red & White Studio, an independent agency in Farringdon, advised Openreach on the rebranding. Although Openreach is a business services company, which provides wholesale services to Sky, TalkTalk, Vodafone and others to sell on to consumers, its 22,000 vans are a common sight on Britain’s roads. Openreach’s engineers make around 25,000 visits to UK properties a day. The telecoms wholesaler does not plan an ad campaign but will rebrand vans and buildings gradually. It will take nearly four years, until April 2021, for the last of the vans to be rebranded because the company wants to minimise disruption, it said. Ofcom demanded that BT should make Openreach a standalone business with its own board because of competition concerns. As part of the legal separation, Openreach has had to drop the BT name from its branding, although it is still owned by BT, as part of the agreement with Ofcom. 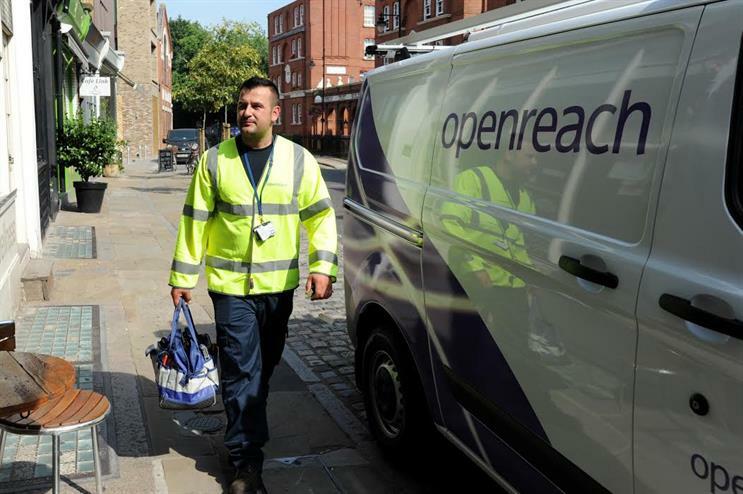 Openreach has faced a slew of problems that led to its separation, including delays over the installation of new broadband lines and an investigation that found it misused contracts to reduce compensation payments to corporate customers that led to a £42m fine by Ofcom. Openreach has previously signaled it could rename itself in future.